For humans, learning is hardwired, a necessary process for survival (Andreatta, 2015). We learn from the day we are born. From walking to talking, this process of learning happens instinctually. We are constantly absorbing new information, filtering what is important and adjusting our actions to adapt (Andreatta, 2015). This blog will explore what a learning culture is, support you in deciding if your organisation has a learning culture and will provide you with tips on how to promote learning in your organisation. First of all, what defines a learning culture? “A learning culture is one with organizational values, systems and practices that support and encourage both individuals, and the organization, to increase knowledge, competence and performance levels on an ongoing basis. This, in turn, promotes continuous improvement and supports the achievement of business goals, innovation and the ability to deal with change.” (Blackwood, 2014). Does your organisation promote individual and organisational learning? 1. Are you involved in personal development opportunities such as attending training courses, reading books and participating in on-the-job training? 2. Is your organisation structured in a way that promotes an increase in knowledge, competence and performance levels? Let’s consider a couple of scenarios. Imagine you are walking into a kick-off meeting for a project that your team runs every year. Have a look at the scenarios below and think about which one sounds most familiar to you. A) Your team pulls out the project plan from last year, you all talk about how the project runs each year, the project lead is the same person from last year (they know what they are doing after all!) and you then assign someone to update the dates on the timeline plan. 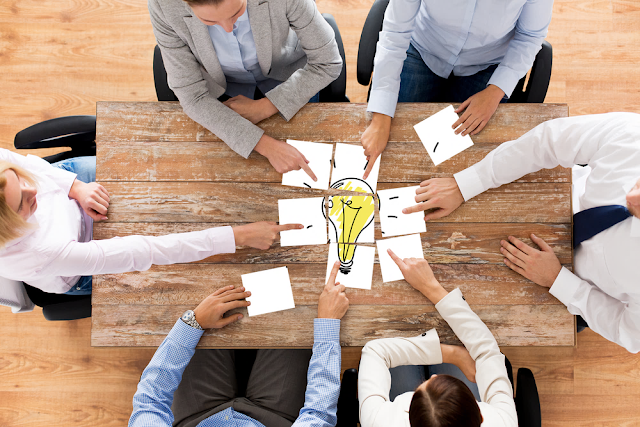 B) You have a brainstorming session with your team where everyone comes with new ideas related to the project. You implement some new ideas including trends in the industry, update the plan and assign a new project lead to provide them with exposure to a new set of skills. So, which scenario was most relevant to you and your experience at your organisation? If your answer is A, your organisation could potentially increase its capacity to support a learning culture. If your answer is B, it sounds like you have a sufficient learning culture (in this instance of course!). If neither seemed to fit, have no fear, there is a third scenario. This scenario is less explicit in nature, though has a significant impact on the learning culture of an organisation. C) Preaching with no follow through. Imagine that option B is a regular occurrence for your team. You brainstorm new ideas, you are assigned to new projects to learn new skills and as a team you consistently talk about the importance of trying new things, learning new things and keeping up to date with industry trends. The meeting goes great, though as soon as everyone returns to their desk, everything goes back to normal. The project lead that was assigned ends up convincing the previous project lead to take over, new ways of doing things become too difficult and are removed from the plan and your leader doesn’t seem to worry when the project plan reverts to its original state. Normality is restored! But what does this mean for the long-term sustainability of your business? Today, change is rapid. New technologies, an unpredictable environment and an overwhelming amount of new information (Reeves & Deimler, 2011) results in a need for businesses to continually adapt to an ever-changing environment. How do you create a learning culture that enables your employees to increase in competence and your organisation to be adaptable to an ever-changing market? It is all well and good to preach an environment of learning. The important part is what ‘actually happens’ in the day-to-day life of your organisation. Are employees provided with opportunities to learn? This could be face-to-face training, eLearning, books or even on the job training. As an organisation do you look for better ways to do things rather than stick to the status quo? Do you keep up to date with industry trends? Provide employees with personal development action plans and keep track of their progress. This is a great way for your organisation to show support for learning and provides employees with a framework to create an effective and relevant learning plan for them. You of course may not be able to promise the world in terms of development opportunities, though this is a great opportunity in itself to start a conversation around potential knowledge gaps. Encourage teams to hold brainstorming sessions when projects are kicking off. This is a great way to encourage new ideas and ensure projects are continually evolving and adapting with industry trends. Ensure that the conversation is facilitated properly, employees should feel safe and be encouraged to share their opinions (Graves, 2016). Ensure that you set time aside to research trends in the industry. You can do this by researching on the internet, attending industry conferences or even networking with industry professionals outside of your organisation. In this day and age, you have to be prepared to adapt at the drop of a hat. Be proactive and find out what future changes will be necessary before it’s too late. Organisational learning is an ongoing process and should be a significant part of your organisation’s DNA (Blackwood, 2014). What strategies do you use to promote learning both individually and at a strategic level? Thank you for reading and we hope this blog added value to your day!